Jobst Relief Thigh High Compression Socks with Silicone Top Band CLOSED TOE 30-40 mmHg are great compression socks designed specifically for people with DVT and CVI. 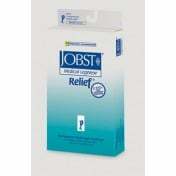 Relief by Jobst provides great quality and features a closed toe design. The reinforced heel on these Compression Stockings 30-40, available for men and women, gives you greater durability. Thigh High Compression Stockings are manufactured with a silicone top band that helps the stocking stay up the whole day. These stockings also help hide spider veins, skin blemishes, scarring, and help control lymphedema.